Properly (re)sealed paint cans could have a shelf life of 10 years! Don't use rechargeable batteries in your smoke detector, buy new. Check your smoke detector twice a year. Keep tires on your property out of the rain! Tires fill with water and make a perfect habitat for mosquitoes. Asbestos should be handled by a certified contractor, check your local yellow pages for listings. Flat screen TV & Computer Monitors can be recycled at most electronic retail stores. Oil-based paints are considered Hazardous Household Waste (HHW) and are illegal to throw out in trash or recycling. Paints of this type are toxic, flammable, and contain harmful chemicals; older cans (1978 and before) may contain lead. For these reasons, oil-based paints must be taken to HHW collection events. Latex paint (water-based) manufactured before 1990 may contain mercury and many current exterior latex paints still do. Because of this and other environmental reasons, latex paints must not be disposed of in liquid form. Latex paint can be disposed of as trash if it has been dried out. To dry small amounts of latex paint, find a safe area away from pets and kids, remove the lid and let the paint dry in the can. You may need to leave the lids off to show your trash collector that the can is safe for collection. If you have a larger amount of latex paint, mix with kitty litter or shredded newspaper to help paint dry faster. Never pour latex paint into storm drains, onto the ground, or into streams or rivers. Never place liquid latex paint, oil-based paint, or stains in trash. Determine the type of paint: latex or oil-based. 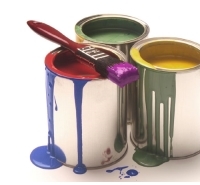 Consolidate latex paints and oil based paints separately to make full cans. Dry out latex paint and throw away in trash. Bring oil-based paint to HHW event. Never mix paint with other chemicals. If you’re not sure which type of paint you have, please bring it to the HHW event. Curbside recycling programs do not collect rechargeable batteries. It is illegal to throw rechargeable batteries in the garbage and it is up to Hunterdon County residents to recycle properly. This includes car/truck, Lithium, Lithium-Ion, and button cell batteries. Batteries are always accepted during Hunterdon County’s Household Hazardous Waste collection days. Always check what type of battery you’re throwing away, Lithium and rechargeable batteries sometimes look like regular alkaline batteries. Lithium batteries must be recycled and should never be thrown out in the trash. Rechargeable batteries can be found in a variety products: Curbside trash and recycling haulers do not collect rechargeable batteries and most types of single-use batteries. This includes lead-acid, lithium, lithium-Ion, and button cell batteries. It is illegal to throw these batteries in the garbage, and Hunterdon County residents and businesses must recycle these batteries properly. Numerous stores and businesses provide recycling bins specifically for battery recycling. Batteries are accepted during Hunterdon County’s Household Hazardous Waste collection days. Rechargeable Batters are found in numerous household items. Dispose of properly. Button Cell Batteries may contain lithium, mercuric, zinc air, and silver oxide which makes recycling a must. These batteries may be found in toys, thermometers, hearing aids, wristwatches, calculators, and many other devices. Lead-Acid Car Batteries car batteries can be returned to almost any store that sells car batteries. The lead and plastics from the batteries can then be recycled and used to manufacture new products. Lithium and Lithium-ion Batteries Lithium and lithium-ion batteries sometimes look like regular alkaline batteries. All types of lithium batteries must be recycled and should never be thrown out with trash. Motor oil is accepted (with no quantity limit) at Hunterdon County’s Household Hazardous Waste collection days. When selecting a container to hold used oil, avoid plastic bottles or containers once used for bleach, cleaners, or automobile fluids such as antifreeze. These containers may contain residues that will contaminate the used oil. 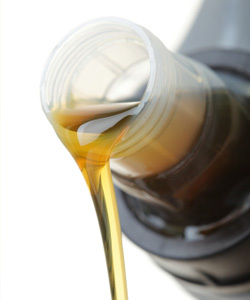 Motor oil can also be recycled at most gas stations, service stations, repair facilities, and quick lubes. Recycling oil keeps our rivers, lakes, streams, and ground water safe. According to the EPA, used oil from one oil change can contaminate one million gallons of fresh water — a year’s supply for 50 people! 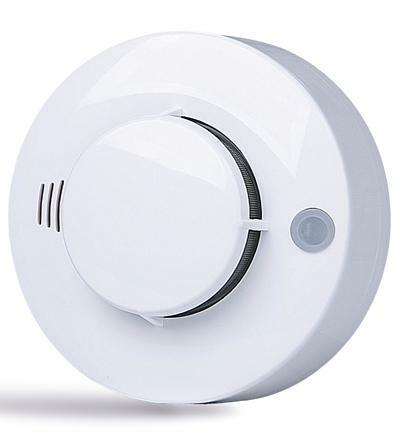 Smoke detectors, the most common being ionization chamber or ICSD, are not recyclable. The inside electronic circuit board contains a small amount of Americium 241, a radioactive material. Because of this, it’s important to contact the manufacturer for information regarding proper disposal. Check your smoke detector twice a year. Don't use rechargeable batteries in your smoke detector, buy new. Remember to dispose of used batteries accordingly. Large propane tanks (20 lb. and over) are not recyclable. Please contact your local propane provider for information on tank exchange and removal. 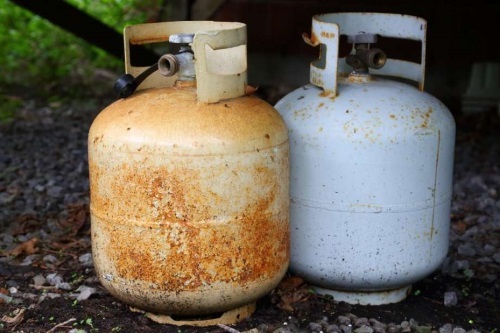 *Small empty grill bottles are accepted at the County Household Hazardous Waste Collection events. Refrigerators, air conditioners, and dehumidifiers need a Freon “certificate of evacuation” before recycling. Check the phone book or the Internet for more information on Freon removal. Improperly released Freon rises into the stratosphere and is broken down by strong ultraviolet (UV) light, which then releases chlorine atoms that deplete the ozone layer. Contact your appliance repair person, retailer, or manufacturer for proper removal of Freon. Hunterdon County Transfer Station will only accept refrigerators, air conditioners, and dehumidifiers with a certificate of evacuation. Regularly checking tire pressure and rotating tires will greatly reduce tire wear and maximize your cars gas mileage. Caring for your tires will extend tire life, reduce your carbon footprint, extend gas mileage, and delay the purchase of costly new tires! Check with your local municipality about the availability of used tire recycling and planned recycling events. 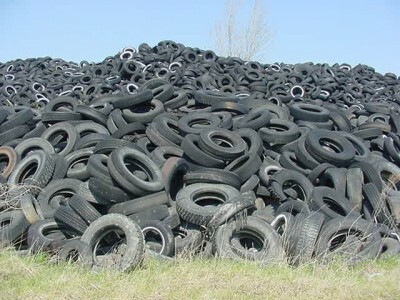 Visit the State of New Jersey Department of Environmental Protection’s web page for information on recycling and the closest scrap tire facility. Bring your used tires to your local automotive service station, they may be involved with a tire recycling program or be able to help for a fee. Asbestos was once used as a heat insulator in a wide range of building materials and consumer products. Over time asbestos may become brittle, and during renovation or demolition may break apart and become airborne. If asbestos fibers are inhaled, breathing problems may occur. Asbestos has been linked to an increased risk of lung cancer, mesothelioma, and asbestosis. If you believe asbestos is in your home, the best approach is to leave it alone. 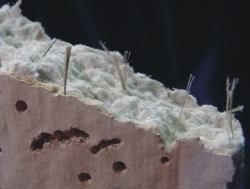 Once disturbed, (home repair, sanding, demolition) small particles and fibers can become air-born and inhaled. Hunterdon County does not inspect homes or businesses for asbestos and recommends contacting a professional for removal and handling. Hunterdon County will accept up to 80 lbs. of asbestos per resident during its Household Hazardous Waste Collection Events. When disposing of asbestos, please dampen with water, double bag, and seal with tape. Recycling cell phones, smart phones, and tablets has a positive impact on the environment and industry. 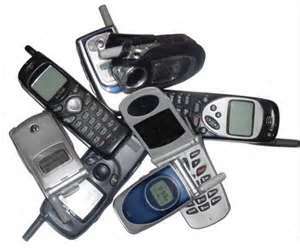 For every million cell phones we recycle, 35,274 pounds of copper, 772 pounds of silver, 75 pounds of gold, and 33 pounds of palladium can be recovered. The recovery process of these materials creates jobs and provides income for municipalities and businesses. Preventing these devices from entering landfills or incinerators keeps toxic materials out of our environment. Most cell phone manufacturers, retailers, and service providers have ongoing programs where you can drop off or mail in your used wireless device. Erase all the phone’s memory, contacts, and stored information. Follow instructions from your wireless provider on how to conduct a factory reset. Remove your SIM card and cut in half or shred. Do you have a medicine chest full of unused and expired prescription drugs? A permanent drop-off box is conveniently located inside the County Justice Center lobby and is accessible during working hours (Monday-Tuessday & Friday: 7am to 6pm; Wednesday & Thursday 7am to 8pm. 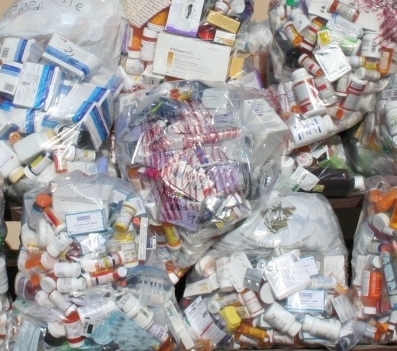 Remember, improper disposal of prescription medication is hazardous!